In the mid-fifties I lived with my parents in South Birmingham at Rubery. During the school holidays my mum took me for walks in the Lickey Hills and one day we ended up at Barnt Green station, which is on the main line from Birmingham New Street to Bristol. I think we stopped for half an hour or so and perhaps only saw two or three trains but it was enough to spark my imagination. 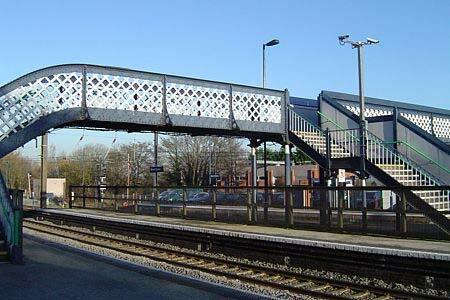 Photo - Barnt Green station in 2008 with my favourite foot bridge. A few weeks later I was back at Barnt Green station with my mother. Even in those days an eight year old boy was not allowed to wander too far from home especially through the woods surrounding the Lickey Hills. We stopped longer this time and saw more trains. We might have taken some sandwiches and a drink. These visits to the railway were a fine weather activity and so when autumn came visits were suspended until the following Easter. I was now nine and I remember meeting other boys watching trains. They planted the seeds of collecting numbers. I was now a trainspotter! 1957 was when I started to show more than a passing interest in trains and from now on a notebook and pencil were essential on any trip by train. Soon the vocabulary of the day was learned although some went over my head in the early days. Why for example was the loco 56-90 when it clearly said 45690 on the cab side? Why 44-43 when it was really 44443? This puzzled me a few more months until I realised it was essential shorthand when passing a large steam shed as most of the locos started with '4'. Types of loco became easy to identify - there were Jubes, Pates, black fives, 8Fs and 4Fs. There were namers too. These locos carried names reflecting the various colonies in the British Commonwealth. Occasionally there were engines that didn't start with '4'. Large standard class 9Fs trundled through the station in the 92xxx series and very occasionally you might even see an engine number starting with 6 a rare visitor from the Eastern Region of British Railways. By 1958 I had my first ABC and was able to underline numbers. I could now keep a record of 'cops' - that is engines I hadn't seen before. There was also another major change in that I was able to go to the station by myself. This meant that on any fine Saturday during school time or any during the holidays, I would spend all day collecting numbers. In those days everything was steam hauled. There were very few trains down the Redditch branch and in any case the locos were generally less glamorous! The route was not so busy in those days with perhaps 4 or 5 trains per hour. There were long periods when nothing happened. Suddenly there were bells from the signal box. It was time to see which 'pegs' (signals) came off and get ready to see what was coming. Hopefully it would be another 'cop'. The station is still there with the footbridge that was my favourite viewpoint. It is much busier now with 323 class emu on the Redditch trains and Voyagers, Turbostars and occasional HSTs on the main line. There is some freight but that seems to be a fraction of the old days. The railways have moved on and are perhaps more efficient. How I would just love to spend another hour back in 1958!